The pumpkins were .50 cents, the candle is from “W-Mart” – they have several nice scents & colors for $5.50 & they are huge 4 wick candles! 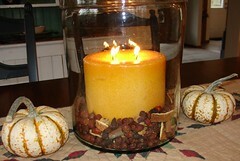 The glass jars, as I already mentioned, are from Pottery Barn. They were on sale for $7. I also added some rose hips & orange peel fixins. We so enjoy the sight & scents from this display as we enjoy our family dinners! Fall displays don’t have to be expensive! Check your local Pottery Barn for sales they may be having!